One of the biggest outstanding questions about the new H1N1 Swine Flu epidemic is the mortality rate. Most of the cases outside of Mexico have been quite mild, whereas there have been a significant number of deaths linked to this flu infection in Mexico. A superficial look at the limited data we have suggests that the virus might be similar to routine human flu (0.1% mortality rate) outside Mexico but more like the 1918 flu (2.5% mortality rate) in Mexico (but note that I don’t believe this is the case!) Why the difference? Different environment – Are people in Mexico City exposed to different opportunistic bacteria? To more pollution? Slower or worse health care? My opinion — possible, but not really consistent with our knowledge about influenza virus. Different virus – Is the virus circulating in Mexico the same as we’ve seen elsewhere? My opinion: Although we haven’t yet seen genome sequences from Mexican virus, this is unlikely, because we have seen sequences from patients who presumably caught the virus in Mexico, and these look like all the others. However, I want to throw out one more possibility — not because I think it’s the most likely explanation, but because I think it’s the most interesting explanation, at least to me (and it’s my blog, so I get to choose). (And I’m sure I’m not the first to consider this, by the way — the CDC guys are presumably already thinking about this possibility.) That is that the virus we are seeing now is not the same virus that caused the mortality in Mexico. We are now seeing the human-adapted virus, whereas (remember, still speaking hypothetically) the virus that killed the patients was still swine-adapted. As the virus adapted to humans it became less virulent and better at human-to-human transmission; we are therefore seeing the adapted, lower-virulence virus, and the high-mortality virus has already gone extinct. To test this, we need not only current samples from Mexico, we need samples from the earliest patients they had. There are precedents for the pieces of this, though I don’t know offhand of an example where both halves have been seen. As an example of rapid evolution as a virus shifts species, there’s SARS virus; it jumped from civets to humans; we saw the genomes of the virus evolving at a furious rate as it adapted to humans. 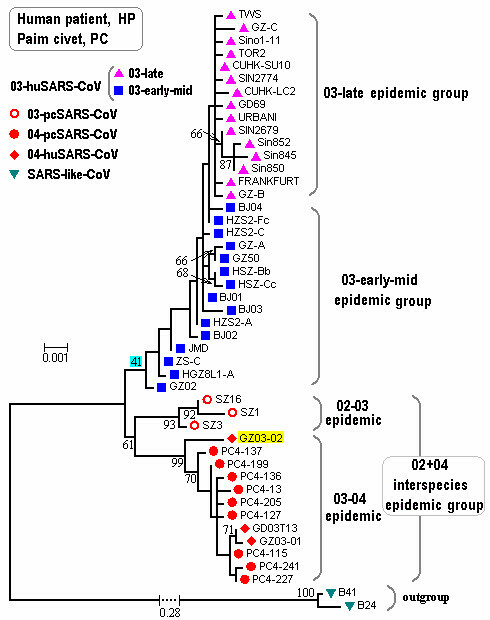 (The figure at the top here shows evolution of the SARS S protein1 – click for a larger version.) Certainly we know that viruses in general change their virulence (in both directions — increased and reduced virulence) as they adapt to a new population. … and really, a lot more — this has been one of the major themes of my blog. But surely the CDC or WHO has samples from the patients who have been dying for the past two weeks, and can ascertain if the virus has adapted? I believe the denominator theory. I like your theory! It makes a lot of sense. And, I hope you are correct! I like you story, remember all the viruses are part of the evolution. Whoever survive are the winner, that’s why we call it evolution, whoever die is not strong enough. my mom has a flu and is currently in ICU with h1n1 symptoms she has been here 35 days in ICU and she come up negative for every thing they tested for she just started having problems going BM and I am worried that this strain of flu is going to cause an infection in her intestannce they looked at her stom today and found no blood but infulmation so they put her on an antibotic she has been on a breathing machine all 35 days so far any info she came to the hospital with a hard time breathing and trowing up and diera. Old post but in response to Apotik, it looks like we won this time! Its amazing looking back how this simple fact was overlooked in all the H1N1 scare hype, yet bloggers like yourself could still see the simple truth. Maybe the increased mortality rate in Mexico contributed to the fear at the time? Sure. But I’m sure that’s much consolation if a virus kills your family. Definitely funny to see people talking about the swine flue in terms of evolution though. Looking back it won’t even be a footnote in human history like the 1918 epidemic. Lol! We always seem to win when it comes to these viral outbreaks that threaten to end the species. SARS, H1N1…is it really because we took proper precautions, or is it because the hype was overblown anyways? Even in 2009, Iayork’s article mentions that the mortality rate for h1n1 was similar to normal flu…why was there so much fear?